Each packed in a singe PE bag together with spare parts and instruction, 50 pcs into one carton. 10 working days after 30% deposit in advance. 1. 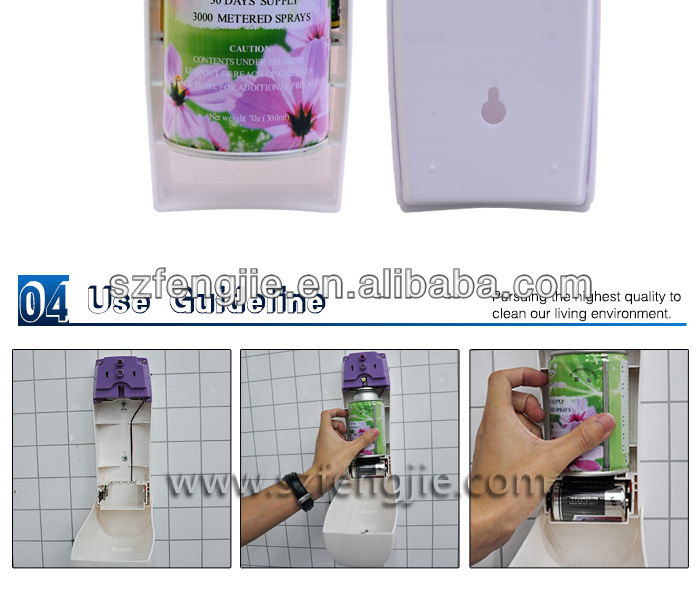 Long-lasting fragrance, made of high quality oil based air freshener. 2. 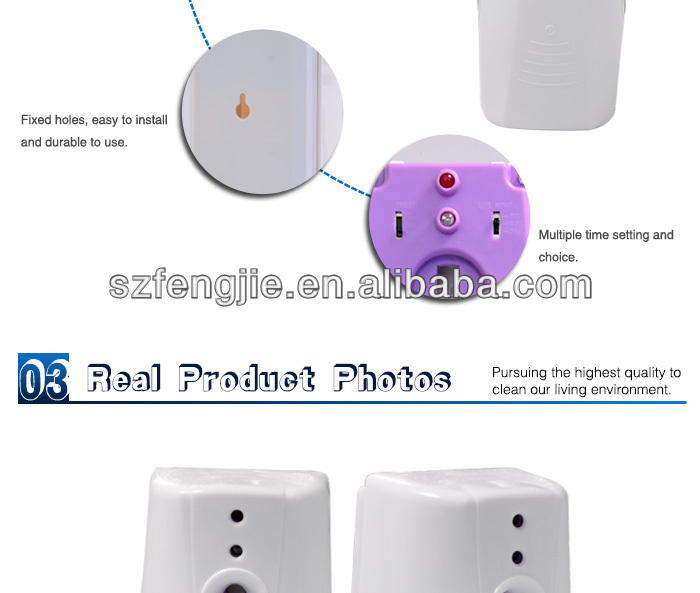 Multi-use, for car, home, office, ktv, spa, hotel, toliet etc. 3. 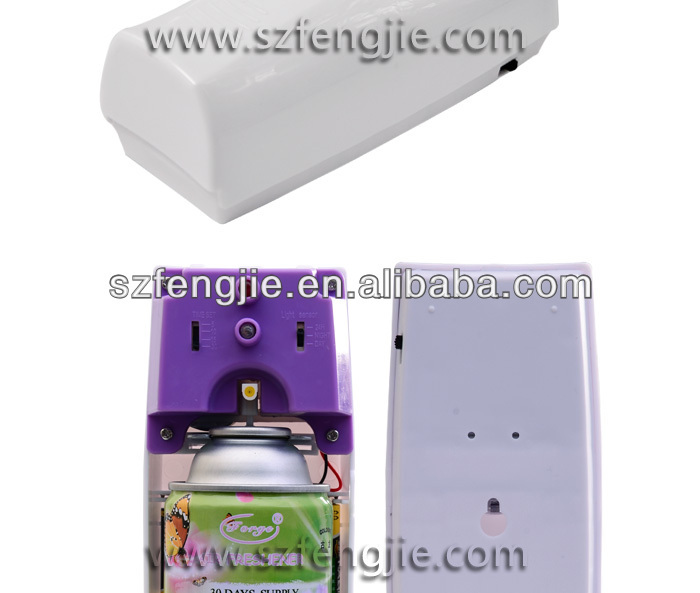 Can set the time of spraying,when to start and how many minutes last. 4. Elegant design, suitable for hotel, restautant, and any elegant place. 5. OEM / ODM service is provided. 6. Great service at great price. (2) Scents: can meet your fragrance requirements. 1.Lead Time:20days after order confirmed for 3000pcs,after 30days for 10000pcs. 1. Position: decide where to install the dispenser for convenient use . 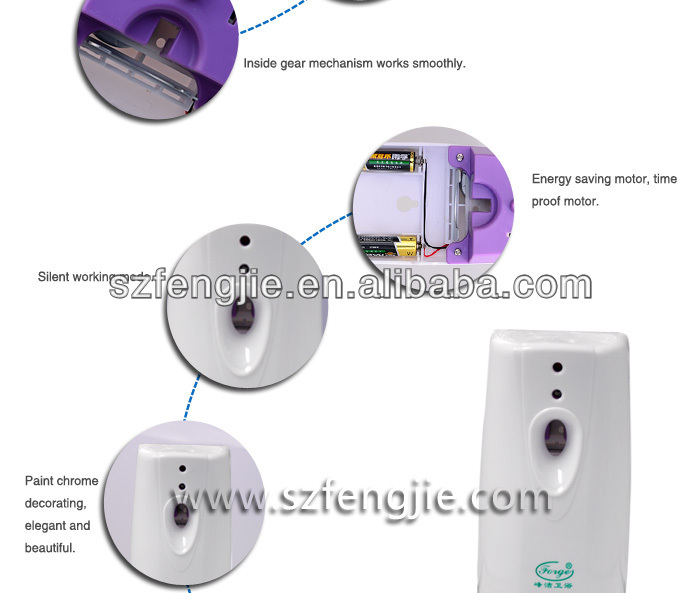 and screw to secure to dispenser permanently onto the wall. 1)Experience:With many years of manufacturing history, mature technique and professional. with competitive price and quick delivery. 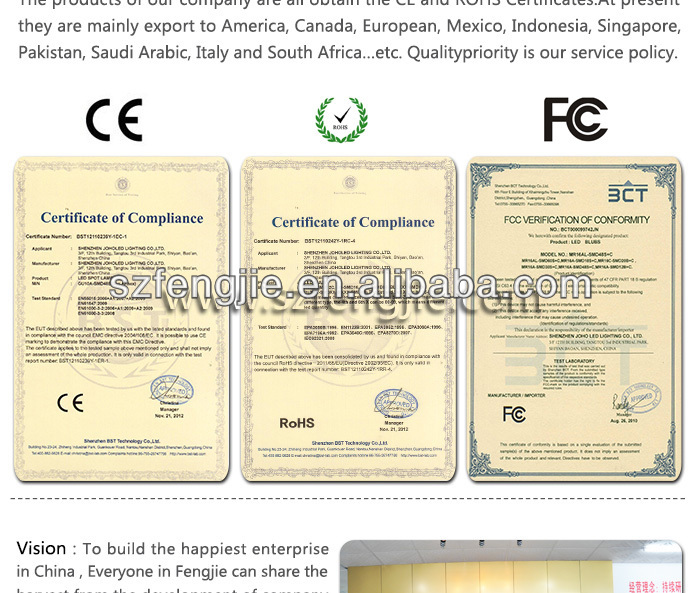 2)High Quality:Our products must strictly control the high quality and low price. 3)Cost-Saving: Help customers to save costs by making reasonable machining processes and refining products designs as required if allows. 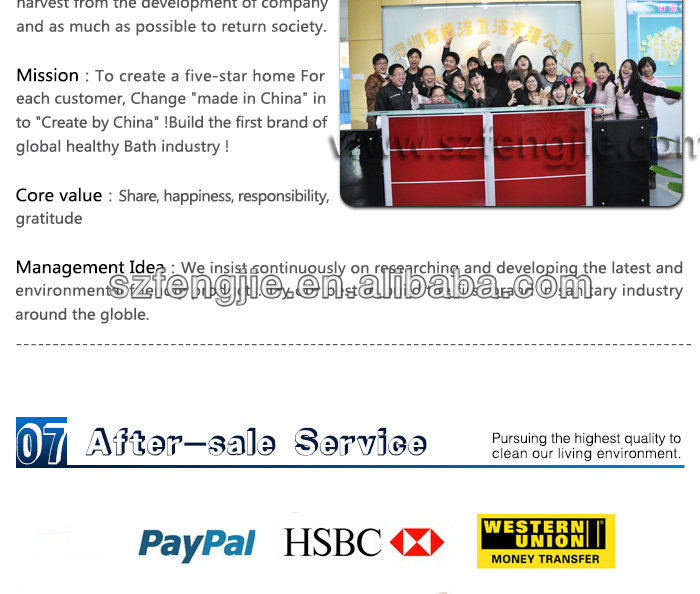 4)Honesty: We will let our customers know in advance if we have any problem that we can't meet the given requirements. 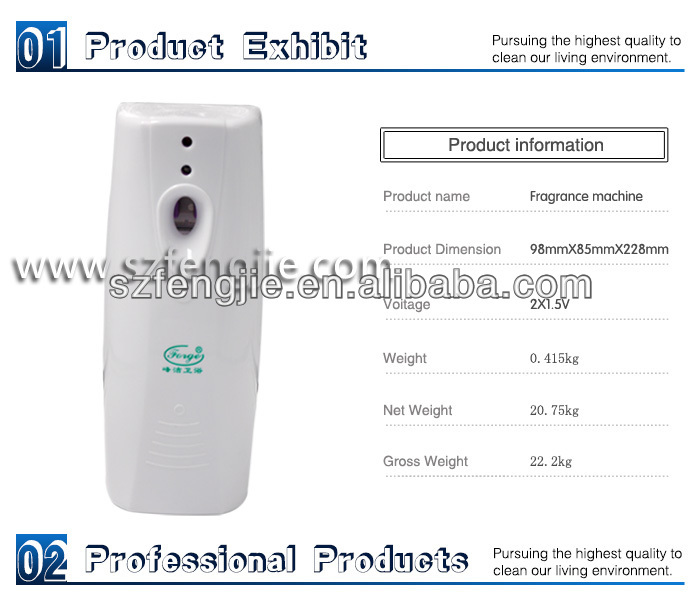 Fengjie Bathroom Company, was established in 2007, is a company specializing in the production of aerosol dispenser ,LCD aerosol dispenser, remote control aerosol dispenser, aroma diffuser, air freshener, automatic/hand press soap dispenser, hand dryer, hair dryer, paper tissue dispenser, tissue box, sensor disinfection dispenser machine, tray for hotel, and other sanitary products, use for hotel, bathroom, home, school, hospital and other public place. Q1: What about the shipping methods? 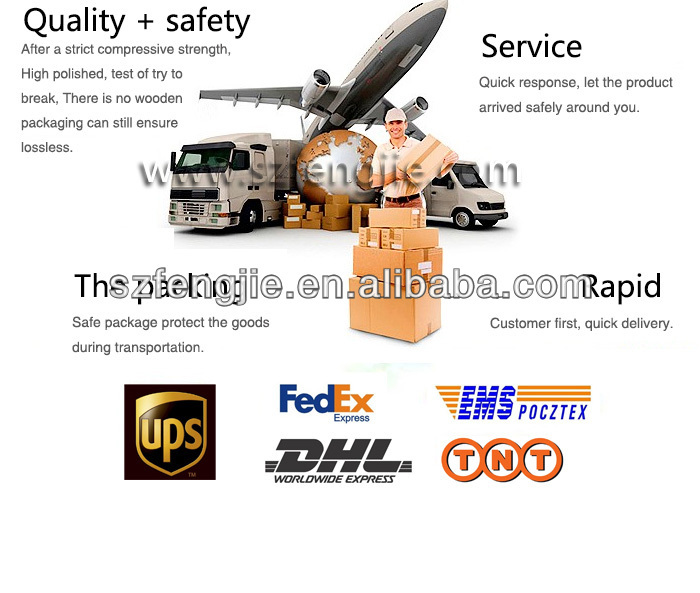 A1:For urgent order and light weight, you can choose the following express: UPS, FedEx, TNT,DHL,EMS etc. For heavy weight, you can choose to deliver the goods by air or by sea to save cost. Q2: What about the payment methods? A2: We accept T/T,L/C for big amount, and for small amount, you can pay us by Paypal, Western Union, Money gram, Escrow ect. Q3: Can I print our logo/barcode/unique QR code/series number on your products? A4: Sure, we can arrange the sample to you by freight collect .For existing samples,1days and for free, and for samples with your logo,3days and need sample cost, please understand. Q5:Can you customized my products in special shape? A5:Yes,we do OEM and ODM ,but for customized products ,we have a bit higher MOQ and you need to afford the mould cost, please understand! Q6:How can you make sure we will receive the goods with high quality? A6:Our QC team will inspect each batch of goods before delivery and all the raw material we used are eco-friendly, we have certificates of CE,SGS, Rohs, EMS ect test.